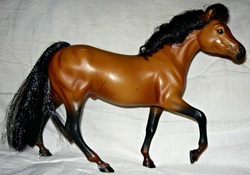 Magnificat-1993 buckskin. Sired by Quimono-r, out of Ojanera-r. Bred by Celtic Song Stables and adopted from them. Promise Me The Moon-1994 buckskin. Sired by 10,000 Promises, out of Mi Vida Loca. Adopted the pedigree from Celtic Song Stables. Do not know who bred this stallion. 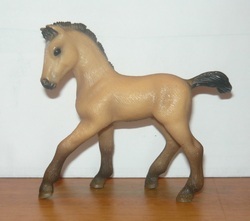 Nurzhan-1994 buckskin. Sired by Impostor, out of Estrela. Bred by Marjo. 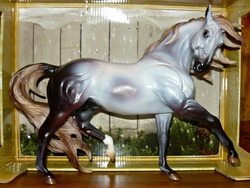 Gustavo-2011 gray (bay base). Sired by Utopisto, out of Lirio. Bred by Marjo. 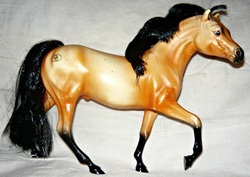 OF Breyer, 2014 Holiday Horse.